Credit: While off centre jigs of this type have been around for as long as people have been turning, some credit should go to Keith Holt for popularising the style of off-centre insert I have used here. The jaws were of my own thinking (but by no means original), as were the carrier inserts, which I made to suit my own holding needs at the time. Making your own wooden jaws to suit chucks that you have opens doors that are generally controlled by the producers of woodturning equipment. We are conditioned by rules and regulations to accept and believe that anything that is not commercially made must be dangerous, and we are discouraged from taking risk and developing personal methods and mechanisms for enhancing and expanding our turning capabilities. One such example is jaws that can be used safely and efficiently on our lathes – without greatly increased risk of injury – so long as we keep in mind the fact that wood can and does split, and is not as strong as metal. These jaws have to be built much more stoutly than their metal counter parts and the method of tightening and use must be adjusted according to the material used. Safety is the key word and should be the primary consideration. Disclaimer: This is how I do it. If you use this information in any way – you do so at your own risk. I have used this turning method for a number of years with few problems, but if you choose to do the same – that is your choice and I will not be held responsible for anything untoward that might happen to you or your possessions or those around you. Suggestions for improvement in design, use and/or safety are always welcomed. Wood is structurally not as strong as metal – you cannot treat it in the same way. It cannot cope with the same loads and stresses, and SAFETY IS NUMBER ONE. If it does not feel safe to you – do not do it! Wood has give to it. In some ways this helps us as wood adapts and conforms to the shapes that are held by it. Suitable woods for chuck jaws are beech, maple, box etc – anything with a consistently fine grain which does not move a lot once seasoned and which does not split easily. My favourites are beech and kiln dried Canadian maple. The former is cheap and readily available, the latter is white and does not transfer colour to the item. They both turn well. For holding turned items for finishing – ideally the wood of the jaws/insert needs to be slightly softer than the wood you are turning so that it doesn’t mark, but within reasonable limits, and the uppermost consideration is the timber’s ability to hold safely without splitting off and braining you. The most UNSUITABLE WOOD to make jaws is MDF, and because of the limitations and sheering factors involved in the bonds between the layers in plywood – I do not use that either. This is only one way to make a set of jaws, and my method of making will vary according to my mood at the time. The end result is what matters, not how you get there. A couple of measurements are required before you start. These are determined by the clearance over the bed of your lathe (the distance from your centre to the lathe bed minus a bit, say 10mm, to allow for jaw movement, times two) and the maximum size you want your wood jaws to be; and the size of the item/insert that you want to be able to hold. To an extent the size of the holding jaws you make is also determined by the amount of offset you want to bring into your work. The insert size is largely determined by the flexibility of the wood it is made of. The jaws I showed hold a 120mm diameter round in ‘perfect circle’ mode. They can hold items from 125>110mm (fully open to fully closed). The external diameter of the jaws was made to suit the inside diameter of a hollow form I was making at the time (160mm) – but can be any diameter you choose and can have a multipurpose function. The wall thickness of the lip of the demo jaws is 20mm and the part that attaches to the travellers (the base) is approx. 8mm thick. This thickness has two considerations: the length of the screws you can obtain to go in your travellers and their shape, as well as the strength of the wood. These jaws were design to be held with a set of screws which were easily obtainable which also fit my chuck travellers. Using this thickness, I have not yet had a problem with failure. Select dry, stable timber. A bowl blank approx. 180 x 25mm thick is suitable so long as the grain is tight and even. Cut a square, and if you prefer, take off the corners at the band saw. Set between centres (with a point at the tail so you can turn right down to it), clean up the tailstock end, turning a very slight concave across it, as you would the bottom of a bowl. Turn a holding spigot or recess to suit your jaws – use a parting tool to make a recess wide enough and deep enough to accept the jaws of your chuck but do not remove the wood on the outside diameter of the work piece – this is the wood that will become your jaws. The part where you make your spigot will be turned away to make the recess, the holding part of the jaws. Using the spigot/recess, set into chuck jaws, and turn the outside to round (max dia) and true up the face to be absolutely flat after withdrawing the tailstock. This is the section that will contact the travellers – it needs to be good. Use a metal straight edge and a light behind to check. If you wish, you can turn the raised ridge that metals jaws have on them. I don’t normally do this. Don’t worry about the pinhole at the centre, you will be sawing through it. Once absolutely trued up, draw a horizontal line exactly through the centre. This will be your first cutting mark. Remove from the chuck and place the blank concave side down on a flat surface (the side that contacts the travellers is now up). Using a square or protractor, draw an accurate perpendicular line to the first to show your second cut line. You preferably need tapered hex-head screws to hold wooden jaws. Ask your dealer for the thread size to fit your travellers and purchase separately for each set of wood jaws you have. How to decide the length of the screw you need: Take off your metal jaws, screw a holding screw into a traveller until it is fully home Unwind one full turn. Accurately measure the protruding length of screw (to the top of the head), and remove the screw from the traveller. Measure the full length and subtract the first measurement. That gives you the thread length you need for the travellers. To that amount, add approx. 8-10mm to allow for an 8-10mm thick base to your wood jaws. In reality the wood jaw base will be 1-2mm thicker than that – as you want the screw heads to be slightly recessed when installed. Now some more measurements: The maximum diameter of the head of the screw, the depth of the chamfer, and the diameter on the outside of the thread on the screw. Match your drill bit size to the last measurement – it needs to be a snug fit. On your chuck, set the travellers so they are halfway opened. Using greaseproof paper and soft pencil, make a tracing of the holes, making sure to mark the jaw numbers as appropriate on the paper. Fastening the paper around the chuck with an elastic band makes this easy. Take your rubbing across to your blank, number the quarters on your wood in accordance with your chuck and stick down the rubbing onto the wood, aligning it accurately with the cross marks. Spray adhesive or masking tape work well. Alternatively, arrange your jaws with accurately sized spacers between them (usually 1/8th inch) on top of your blank so that the pencil marks show between the jaws, and use a can of spray paint to spray mark the holes onto the wood through the jaws. Clean up the jaws with a bit of mineral spirits or emery paper. From the traveller’s side, drill the holes extremely accurately, all the way through. In certain woods, it helps to use a centre punch to set the holes position before you start to drill. They want to be absolutely perpendicular to the face, so take your time. Turn the blank over so that the side that contacts the travellers is down. Now countersink the holes to the correct depth to allow the right amount of wood for the thread length and head depth of the screw, using your depth stop on your pillar drill. It is important that this is very accurate, as you will be turning away the wood down to within 1mm of the screw heads! It is also important that your countersink is centred on your drilled hole, or the jaws will not sit properly once installed. Have you marked al the jaw numbers yet? If not – do it now. Using your band saw, cut through the drilled blank to make four quarters. Sand the cut side smooth and remove sharp corners. Attach them to your travellers, and wind the travellers down until they close. Adjust the positioning of the jaws, just as you would on metal ones, reopen your jaws, and give an added tweak to the screws. Due to the nature of wood, it is a good idea to check the screws each time before you use your wood jaws. Turn the outside of the jaws to round, soften the corners (they bite). Stop the lathe and sand all the points off. You can even sand the section between the jaws smooth. Wind your travellers out to the midway point. Cut a small spacer the right size, and clamp down on to it in this position – this keeps the jaws from loosening as you work. Now turn out the holding section recess. THIS PART OF THE MAKING HOLDS MANY DANGERS – eight of them, to be precise, and you can seriously hurt yourself and your tools if you abandon caution when doing this. As mentioned before – the size of your recess is determined by what you are going to hold in it. Mine was turned to 120mm diameter. The shape needs to be in the form of a dovetail. This same angle is replicated in any insert (offset or straight) that you will use in your jaws. Very carefully part in at your chosen diameter – do not dovetail in at this stage. Go in small steps and be sure to stop the lathe frequently to check where you are relative to where the screw heads are. Take out the wood in the centre of the jaws, leaving at least 1mm (or even more) of wood above the top of the head of the highest screw. I find a bedan tool useful here. A depth of around 10-12mm is desirable. Once the base of this section has been made nice and flat, use a sharp skew chisel, and carefully cut your angle for your dovetail. I don’t sand this part. Go and have a cup of coffee – if you are anything like me, you will need one at this point. The thickness of this piece of timber is determined by the depth of the recess you turned in your wood jaws. I like at least two thirds of the insert to be inside the jaws, and prefer it if most of the insert is contained. Whether based on fact or not – to me it feels safer that way. I have created all my inserts to be English ash – Ash is cheap and bountiful in the UK. Choose a piece that is just about quartersawn – where the year lines are almost vertical through the wood when the blank is laid flat. The more close-grained, the better. Pine would also work in this situation – but choose fine pine and not the knotted variety. I now also cut through the widest part of the jig, which makes for more flexibility, and have several inserts to cope with different sizes of carrier/item spigots. Cut your ash to about 10mm larger than the true round diameter of your wood jaws (in my case they are 120mm, so I start with a blank of 130mm). Draw lines from corner to corner on one side to ascertain the centre point. 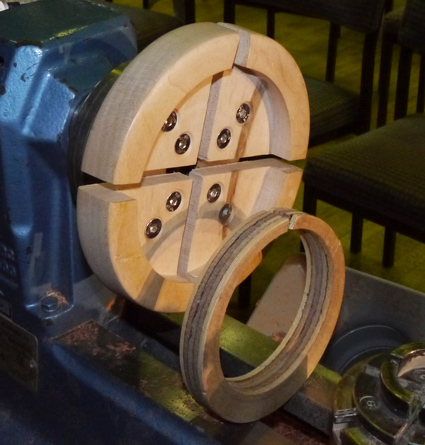 Draw your circle using a compass or plastic circle jig, and cut off the waste corners with your bandsaw. Set the blank between centres, true up the tailstock face and turn to round. Turn a holding spigot on the tailstock side. Hold the blank in your chuck jaws, turn the second face to true. Look at the direction of the grain on the blank, and draw a line through the central axis point so that it follows the direction of the grain of the wood. The line needs to go from edge to edge, and will be used later to cut the jig on the bandsaw. You will mark your desired off-set centre point on this line. Turn the outside to match the size and angle of your wood jaws, in other words your dovetail at perfect round. Check that this is right – tighten your wood jaws down on it and make sure all the surface area touches. Once you are happy with the fit, mark your off-set centre your desired distance from the actual centre point. Wrap a piece of router mat or thin craft foam around the front of the chuck jaws, holding it in place with an elastic band. You can also simply use the front of the jaws as-is, but the grippy surface of the router mat/thin craft foam is safer. Use a point in your tailstock and wind it in securely. True up the tailstock face, ensuring that you tighten up your tailstock each time you get near it with your spindle gouge. If you are careful it is possible to true the flat right up to the tailstock point. Make yourself a flat grippy faceplate – Use dry timber of a stable nature – approx. 4 in cubed. Turn it in spindle mode – with the grain running along the bed of the lathe. Turn to round, to the widest diameter possible. Using a Morse Taper to suit your lathe as a guide, turn an accurate taper on one end of the blank – using 3 inches of the length. This leaves a ‘table’ approx. one inch thick on the other end. Insert the taper into your headstock, tapping it gently in place so it holds. Support with the tailstock if needed. A small pinpoint dip in the centre is ok. Turn the face of the table true, and stick on to it a piece of thin self-adhesive craft foam. Use this in the headstock to drive your blanks when you need to turn a thin piece of material flat on both sides and don’t have a planer. It is essential that the taper has the grain running along the length. Now you have a flat planed, round blank with a dovetail on the side – ready to turn the off-centre inside. Remove from the lathe. Using a ruler, Draw a line through the centre so that the line runs in the same direction as the grain in the wood. This is not only your axis line, but it also functions as your cutting guide. Decide on the offset distance you want. Anything between 6 and 10mm works – the insert I showed is about 9mm. The most important thing is that the insert is narrow enough at the thick edge to be able to flex enough to close down as you tighten your jaws without putting too much strain on the jaw wood itself. Mark your offset along your pencil line, and accurately place between centres at that point. Ensure you have no wobble at this stage! For those who have a vac chuck – use a small holed chuck and align the new centre using your tailstock. I use the jaws of my chuck as a flat and the point of my tailstock to hold the blank in place. (See above for a morse taper friction drive that works in this situation). Turn off the piece of wood that will become the insert. Using a slender parting tool which has been ground to a point on one side – and keeping to your dovetailing angle – simply part off your insert. The point of the tool that cuts through first needs to be on the ‘good’ side – the side of your insert. This gives a clean cut. NB If you set your blank up on the lathe so that the angle gets narrower as it gets closer to the headstock, when you part off, the insert will pop off over the centre and stay on the lathe. It is also easier to part off in this direction. Clean up your insert by hand with a bit of sandpaper to ease the sharp corners, take it to the band saw and cut a small gap at the narrowest end on the pencil line you made. Take out a wedge of about 1/8th inch. This allows the insert to be tightened down around your carrier insert or work piece. Ideally, the insert should be ‘tight’ on your work piece when the wood jaws are in their ‘perfect circle’ position. This ensures maximum surface area contact. It pays to measure all the bits relative to each other as you go, and double check before you cut. The measurement of the carrier insert is determined by the inside diameter of the off centre insert. When turning your carrier you have two options, both of which work. Option one – the base of the carrier needs to be flat so it sits firmly on the base of the recess while turning. The dovetail turned on the side needs to be deep enough for this to happen. I prefer Option two, which is to turn an adequate dovetail (I use about 17mm depth) to provide plenty of holding contact, but I also turn a good shoulder on the carrier so that it sits flat and secure and is well supported on the top of the off centre insert. There is some air (1-2mm) between the carrier and the base of the jaw recess. Generally a soft wood such as lime is good for making carriers. Masking tape will also stick well to lime, but ash, beech or similar also work in the situation. I start with blocks of lime about 110mm in size, set between centres and make a holding recess, either a spigot, or an expansion recess will do. True off the face at the same time, and turn to round. If you use a spigot, note that the end of the spigot must be no longer than the outside edge of the whole cylinder. Set the block into the chuck jaws (in either expansion or contraction mode) and re-true the cylinder, turning the dovetail at the same angle as on the inside of your off-centre insert. Make a strong shoulder. It pays to make sure that there is enough ‘meat’ between the recess area and the dovetail. These pieces take a lot of stress, the thicker the better. b) Turned into a jam chuck for holding a turned item for off centre additions, for example, the lid of a box. c) Turned to a specific shape which will hold an object for turning, e.g. the cup shape to hold a ball. Here, a parallel lip is turned on the carrier, and masking tape is used to hold the item in place, as demonstrated. The item can be moved around within the cup to change the centres, allowing for extremely complex turning. If the lathe is used in a stationary manner, and cutting power provided by outside means, e.g. a Dremel tool or a router, this chuck (primitively, admittedly) imitates a very basic ornamental off-set/rose engine set up – and the door opens to a new and different world of ornamental turning! I would be interested to hear of any adaptations, improvements and uses for these jaws, so please keep me posted!